10th August 2007: “SCI-FI DOUBLE FROM THE PIT”! Welcome to an arty, hand-held edition of Schlock Treatment. Tonight’s budget has been slashed to the point where Scott here is forced to be the Human Tripod - and it wouldn’t be the first time. Tonight’s two very different science fiction films made it back from the Pit of No Return - so if there is a running theme, it’s that they’re both The Pits. First one from the Pit is originally from Italian genre expert Antonio Margheriti, or “Anthony M. Dawson” as he was known to the English speaking world, best known for films about cannibals and killer fish. In 1960 he started an entire genre of spaghetti sci-fi films with Assignment: Outer Space. It was a typically Italian exercise in creating something out of nothing, and not surprisingly at a time when any film with Hercules in the title meant instant box-office, it was sold around the world. For his second space opera Margheriti was handed a bigger budget - which means he was given slightly more than nothing - to create an ambitious, not to mention enjoyable, effects-filled no-brainer: the 1961 Battle Of The Worlds. More moolah meant star billing for an imported American actor. So, almost 30 years after playing The Invisible Man, aging raconteur Claude Raines plays Professor Benson, a cranky, wordy, gas-filled yet sympathetic egghead in Mr Magoo glasses who detects a planetoid dubbed “The Outsider” heading for the pseudo-utopian community on Earth. Against Benson’s advice the Army sends its spacecraft to knock it out but they’re destroyed by a fleet of spining flying saucers who emerge from inside the planet with jagged laser beams a-blazing. The fools! 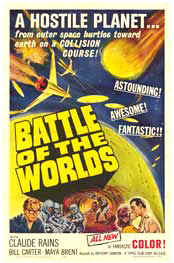 Benson then discovers the planetoid locked into an ever-decreasing orbit around the Earth, suggesting a super-computer from a dying alien civilization inside the planet; his missionary zeal for pure knowledge leads him to offer himself in the ultimate act of sacrifice, descending deep into the bowels of the runaway planet. And they really do look like bowels - glowing red and filled with plastic tubing, a triumph of low-buget ingenuity from the Godfather of Spaghetti sci-fi thanks to his resourcefulness as a special effects wizard, working miracles out of a few toilet rolls and a vacuum hose. Amidst the relentlessly talky script and the pointless romantic interludes, there’s a strange, almost quasi-revolutionary thread against the military industrial complex, but that’s the crazy Italians for you. So, from the man who would one day direct Cannibal Apocalypse comes an early one in the insanely huge Antonio Margheriti catalogue: the 1961 Battle Of The Worlds. Back in high school, one of our favourite six-pack stinkers was The Fiend (1980), in which a supernatural creature resembling a radioactive Twistie enters the grave of a recently deceased music teacher. He comes back from the dead, naturally craving blood, but more unnaturally, still giving home lessons on the violin. It was one of a string of low-budget genre movies from Don Dohler, a Baltimore filmmaker who may have turned out like his more famous Baltimore counterpart John Waters if he’d spent less time gluing together fanzines and devouring Famous Monsters Of Filmland, and more time huffing nitrous and shimmying around with perverts. And just like a John Waters film, Dohler’s movies are filled with would-be thespian matrons and blockheads with thickly nasal Baltimore twangs screaming at each other in garishly decorated sets. In the case of The Galaxy Invader from 1985, it’s the family of a violent, gun-toting alcoholic hillbilly doing the screaming - dear old Paw discovers the crash site of an alien in a green rubber reptile suit, and decides bagging a spaceman before the CIA does means big bucks on the black market. He rustles up a hunting party of greedy Harleyville hicks while the Moon Man goes on a Human Hunt. One early victim of the reptilian rampage is George Stover, a Don Dohler standby who keen-eyed John Waters watchers will recognize as Mink Stole’s father in Waters’ Desperate Living (1977). Compared to most shot-on-video garbage released these days, it’s an unexpected treat - shot on film with a distinct style, albeit a Z-grade one, and with a real wide-eyed, earnest and straight-faced appreciation of the genre which gives Don’s movies a genuine charm. Sadly Don passed away in December 2006 aged 60, but he leaves behind the legacy of his hardly misspent life. 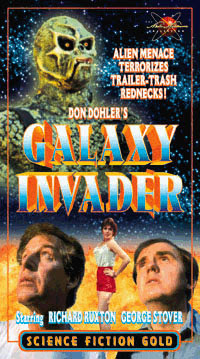 Don Dohler, wherever you are in the cosmos we salute you as we press play on one of your most preposterous stinkers - from 1985, The Galaxy Invader.